Give it a twistNot a fan of black? Go for a deep purple instead. Team with an ornate gold mirror and lashings of white. 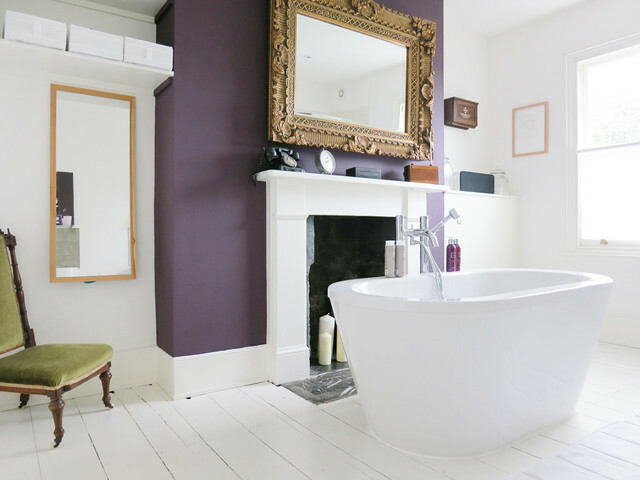 This look works best in period homes, particularly in bedroom to bathroom conversions with fireplaces.Liked this? Share your thoughts in the Comments below. Stick to classicsSome decorating tricks just work, however many times they’ve been done and in whichever room you do them. Hanging a large, gilt mirror above a fireplace, for example, won’t hit the decorating headlines any time soon, but the ornate frame and perfectly matched, oversized dimensions will instantly create a star feature wall (the unofficial ‘rule’ for fireplace mirrors is that they should not overshoot the mantelpiece). Paint the same wall in a moody hue and the whole look will fuse together beautifully. Is there access to plumbing?If the bedroom in question is too far away from the existing water and sewer pipes, plumbing costs can soon escalate. Take this into account when you’re calculating how much you can afford to spend, in relation to the value of your house. Costs will also add up if there isn’t enough space under the floor to accommodate the new pipes. Arrange some plumbing quotes early on in the planning process so you know what you’re letting yourself in for.Find professional plumbers on Houzz.